The Lego Minifigure, one of my favorite things to ever exist on this planet, turned 30 years old today. I owe the minifigure a lot. When I figured out how to pop off the minifig parts and put them back together in custom ways, I’d recreate my favorite characters. At that time, the very early 80’s, it was the only way I could make an entire Justice League (because Mego never made GL or the Flash) to play with. When I needed another set of characters, I’d swap parts again to make the Marvel Universe, G.I.JOE, Star Wars or anything else that I wanted to do. The most important group of characters that I’d make were my own. M-Wave, the Entity, Twofold, Exponent and a lot of other heroes would be snapped together to fight the bad guys I’d made up. They’d roll around in tank-like vehicles or motorcycles and fight in buildings that would be torn down during the fight. Other characters like Longfellow and the Executioner (whose redesign will pop up on Illmosis next year) came out of those ol’ minifig sessions. As crazy as it sounds, that’s where I developed a lot of their basic character traits. 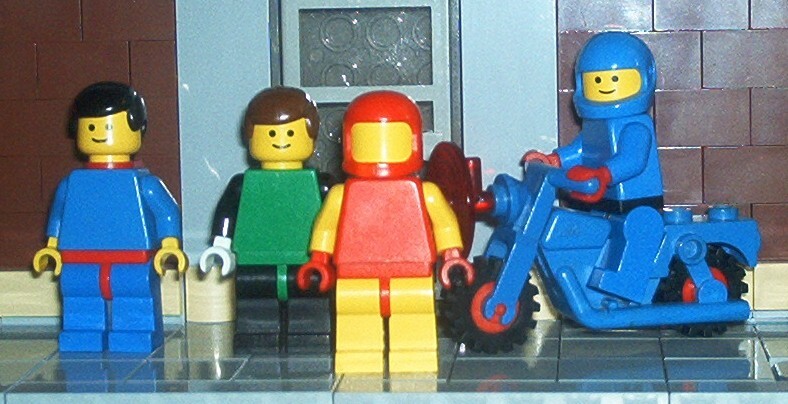 Go Miniman Go is a website that celebrates the trusty ol’ minifigure’s 30th birthday. I’ll have to set up some of my minifig collection this weekend and snap some pics to celebrate.